This article about landfill gas is the next in a series on waste to energy (WtE). We have an abundance of municipal solid waste (MSW) landfill sites across the country that produce landfill gas, a gas consisting of 60% methane and 40% carbon dioxide, that used to be flared off into the atmosphere. Nowadays, however, landfill gas is used to power gas turbine generators, not only producing electricity for the national grid, but also supplying community heat. In the UK, we produce a third of our renewable energy using landfill gas. This is not surprising when 100,000 tons of annual waste can supply the grid with a continuous 1MW annually, this equates to an output of 8,760,000 kWh/year (1000 x 24 x 365). The gas is produced by the anaerobic decomposition of the organic waste portion of the MSW, and this takes place after all the oxygen in the waste has been exhausted, usually after about two to three years. Current legislation requires there to be a membrane laid at the bottom of the landfill site before commencement of operations, and a system of vertical perforated pipes connecting to a gas ring main to be laid to gather in the gas. However the piping can be fitted retrospectively and although this is not as efficient, will still operate. To fit the pipes retrospectively, vertical holes are drilled into the waste right down to the base and perforated pipes, usually about 2”- 3” diameter inserted into the holes. These are connected to a header at the surface and the gas passes from the waste through the perforations in the pipe upwards into the header. 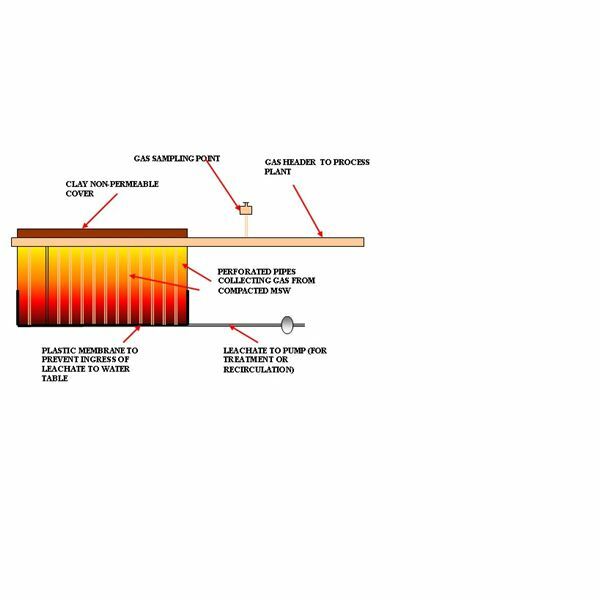 The header can be insulated and left uncovered, covered either by more waste or, at closing of the site by a non-permeable layer of clay laid over the waste area. There is a gas sampling point on the header which must be accessible, but if the header is buried an extension pipe can be fitted to draw off gas samples. The organic component of the waste quickly decomposes due to the heat generated by the compacted waste through the lack of oxygen, and the action of bacteria. This takes place in four separate stages with the gas composition changing in each phase. This involves the conversion of chemical compounds (volatiles) that are contained in everyday household waste and, in plastic containers that are crushed or which decompose. These change from solid to liquid and eventually to gas as the temperature of the waste escalates forming trace components of the landfill gas. This usually occurs particularly where a lot of industrial waste has been placed in the landfill. The same stages of decomposition occur as per the volatiles, again forming trace gasses. The landfill gas design consists of an extraction header outlet that connected to a gas compressor in the processing plant, and this draws the gas from the underground system of pipes compressing it before being passed through a refrigerant plant where the gas is dried. From here the gas is cleaned in a scrubber where the non-methane components are removed, i.e. CO2, nitrogen, oxygen, hydrogen along with any unwanted trace gasses, and it then passes into a storage tank ready for use. In some plants, a portion of the landfill gas is used to run a reciprocating engine similar to a diesel engine, powering an electric generator that producse electricity for the site plant use. The remainder of the gas is supplied to a gas turbine driving an electric generator which produces electricity for sale to the national grid. If a gas turbine generator is used, the exhaust gasses exiting from the turbine can be used to raise steam in a waste heat boiler. 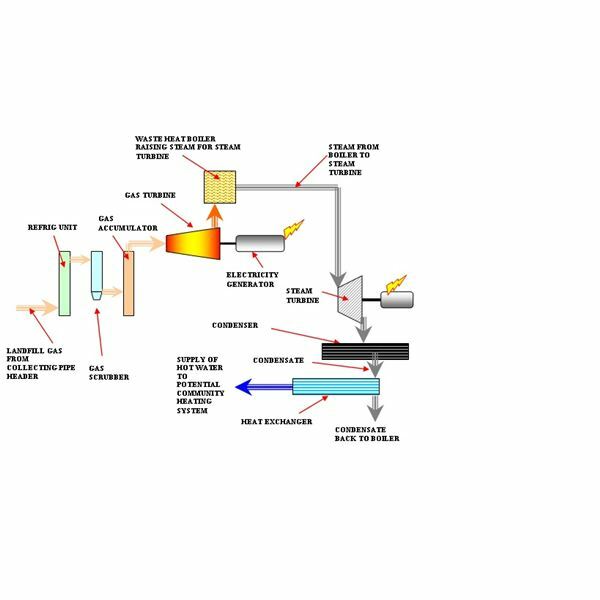 Depending on the quantity of steam raised, the steam can either be used as process steam within in the plant, or to power a steam turbine again driving a generator producing electricity for the plant or grid. Note: When the exhaust from a gas turbine electric generator is used to generate steam in a waste heat boiler and this steam is used to drive a steam turbine, it is known as a Combined Cycle Power Plant. Are Compressed Air Powered Cars Part of Your Future? Maybe! Is the Racing World Ready For Electric Cars? What Is Flow Battery Technology? Is It Organic, Sustainable and Realistic? The Hyperloop: Could This Invention Revolutionize Travel?